5th September 2016, London: The award-winning, independent health and medical communications consultancy Clark Health Communications (CHC) has today unveiled a new positioning. The new positioning will now shape programme planning and evaluation for clients, ongoing CHC training and development of future tools and client service offerings. CHC worked through a structured research and development process for the new positioning that included client research, internal team questionnaires and workshops, competitor analysis and creative development. The new positioning adds to the core branding of CHC and supports the founding principles and values of the company. Building Collaboration This reflects feedback directly from clients about how effectively the CHC team work with each other and how seamlessly they collaborated with clients, often across internal functions. It also expresses feedback that CHC instinctively knows how to build successful collaborations with healthcare professionals, patient advocates, media and other stakeholders as a fundamental part of their approach to communications. Inspiring Confidence This captures the clear consensus from clients that working with CHC made them feel confident. They expressed confidence in the advice the CHC team give, the service provided and the work delivered. And they reported that this really set CHC apart from many of its competitors. 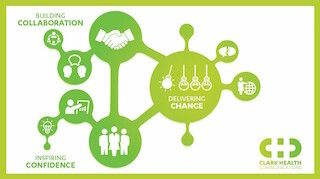 Delivering Change This is the defining mission of the CHC team: to deliver change. It is consistent with CHC’s core belief that communication lies at the heart of fighting disease and keeping people well. The company employs a full range of communications to deliver change, both for client businesses and for healthcare professionals and patients around the world. The award winning consultancy has grown consistently since its inception in 2011, adding staff and moving office twice in the last 12 months. The agency continues to work on international programmes in multiple areas of women’s health and in prostate cancer, haemophilia, sleep/breathing disorders, health informatics and medical diagnostic services and UK programmes in mental health, women’s health and gastroenterology. Further information on CHC and the new positioning can be found at www.clarkhealthcomms.com and via Twitter, Scoop.it and LinkedIn. You can also say hello@clarkhealthcomms.com or call the team on +44 (0)207 492 1900.